Carlos Ayala-Grosso and his colleagues at the Venezuelan Institute for Scientific Research in Caracas have found evidence of specific markers of the disease in patients who have not yet been diagnosed with Alzheimer’s. In total, five healthy subjects participated voluntarily: three with mild cognitive impairment and two with Alzheimer’s. Ayala-Grosso applied the basic test of the odor detection threshold, blood tests to analyze genetic risk factors, magnetic resonance imaging (MRI) to determine brain atrophy, and biopsies were taken from the olfactory mucosa (one of the few places in the body where you can access the nervous system under local anesthesia and a noninvasive endoscopic surgical procedure) for the existence of β-amyloid in the tissue. 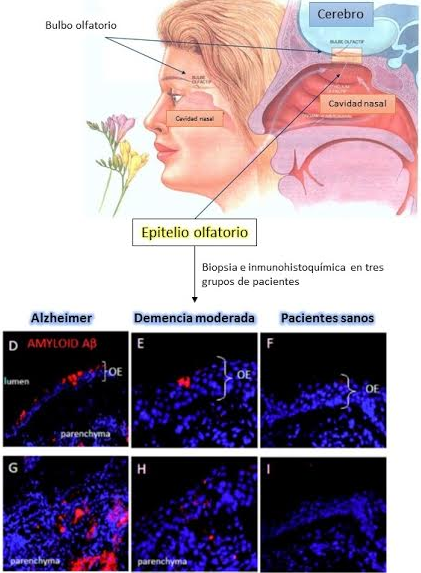 The results revealed deposits of β-amyloid protein in tissue biopsies of the olfactory mucosa of both patients with mild cognitive impairment and those diagnosed with Alzheimer’s. In contrast, healthy subjects of the group showed no accumulation of this protein. It is thought that the accumulation of the protein can prevent the regeneration of olfactory cells, consequently resulting in progressive and irreversible damage of the olfactory neuroepithelium, and therefore result in a loss of the sense of smell. Figure 3 The olfactory epithelium is located on the “roof” of the nasal cavity. The tissue biopsies uncovered the presence of β-amyloid even in patients with moderate dementia. This finding suggests that the loss of both smell and cognitive abilities are associated and reinforce the fact that the olfactory mucosa could be a resource for biomarkers of Alzheimer’s disease in the earliest stages of the disease. Alzheimer’s is a neurodegenerative disease that involves the progressive death of certain neurons in the cerebral cortex. The neurons that gradually succumb are part of neural networks in the temporal and parietal lobes of both cerebral hemispheres, responsible for the maintenance of cognitive, behavioral and psychological capacities of individuals. It all started in 1901 when a 51-year-old woman named Auguste Deter was admitted to a mental hospital in Frankfurt, Germany. She suffered from cognitive deficits and language, auditory hallucinations, delusions, paranoia and aggressive behavior. She was under the care of one of the doctors at the hospital, Dr. Alois Alzheimer, and when she died in 1906, he studied her brain. Upon examination of her brain, he discovered plaques, tangles and atherosclerosis, and presented the case at a meeting of psychiatry in 1907. The disease has since carried his name. 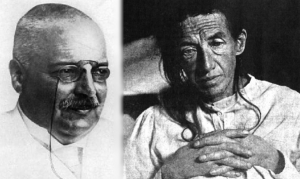 Dr. Alois Alzheimer and his patient, Auguste Deter. Wikipedia. Today we know that senile plaques are formed by the accumulation and precipitation of the β-amyloid peptide on neurons. It is well documented that patients with Alzheimer’s disease also suffer from anosmia, or the loss of their sense of smell. In fact, losing odor identification is increasingly common as the first sign of neuronal damage in Alzheimer’s. Taking this into consideration, and similar findings in animal models, Venezuelan researchers have succeeded in finding a link between smell and Alzheimer biomarkers. In 2013, an estimated 44 million people in the world had dementia, with 7.6 million new cases each year. It is estimated that the number of patients will double every 20 years, reaching 76 million by 2020 and 135 million by 2050, worldwide. The prevalence of the disease in Latin America is high, between 6 and 6.5 per 100 older adults, with an increase of 146 percent by 2040 compared to 2001, surpassing any other region of the world. The annual incidence is around 400,000 cases per year, which will bring the current population of patients from 3.4 to 4.1 million by 2020 and 9.1 million in 2040, similar to the estimated figure for North America. Dementia is, along with arthritis, the leading cause of disability and dependence among adults over 60 years old. This leads to a tremendous economic burden, estimated at about US$23 billion annually in Latin America. These costs will increase proportionally with the increase in new cases of the disease. Dementia is a condition characterized by progressive and irreversible deterioration of memory, language, behavior, and cognition that adversely affects the development of the individual within society. It is the leading cause of disability in older adults and the largest contributor to economic and psychological dependence and family overload. And of all dementias described, Alzheimer’s disease is responsible for up to 70% of all cases. Although clinical symptoms and other variables are a sign that one is suffering from Alzheimer’s, the definitive diagnosis is always post-mortem, as it is with an autopsy that one can access the brain and find senile plaques of β-amyloid peptide indicative of disease. In addition, the long interval between the onset of neurodegenerative changes and the clinical onset of dementia (15 to 20 years) makes current treatments to help alleviate some symptoms ineffective and ineffectual against disease progression. A realistic goal would be to delay the clinical onset of disease to later in life. It has been estimated that a one year delay in the onset of Alzheimer’s symptoms could result in the reduction of 12 million cases worldwide by 2050, and a significant reduction in costs. 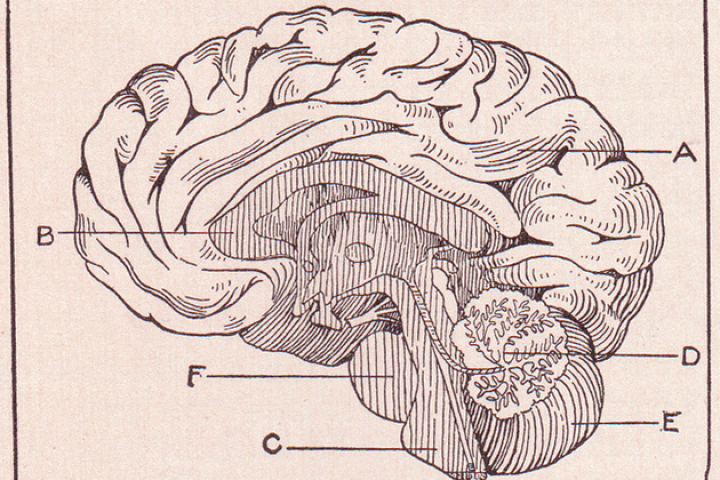 But how can we anticipate the symptoms of dementia? The nose may be the answer. Felix Moronta is Venezuelan molecular biologist. He is currently a post-doc at the Venezuelan Institute for Scientific Research in Caracas. His blog can be found at http://felixmoronta.com . Juan Llibre and Raúl Gutiérrez (2014) Dementia and Alzheimer’s Disease in Latin America and the Caribbean. Cuban Journal of Public Health, 4 (3).